Why would I need self storage in San Diego, CA? There are a variety of reasons why you might need self-storage in San Diego, CA. How much is a storage unit in San Diego, CA? The cheapest storage unit in San Diego, CA is $48.00 per month. What size storage units do you have available in San Diego, CA? In San Diego, CA we have sizes that range from 4'x4' to 10'x40' to suit your storage needs. How much is it for a 4'x4' storage unit in San Diego, CA? The cheapest 4'x4' storage unit in San Diego, CA is $60.00 per month. San Diego is a sunny Southern California beach city known for its lush parks, vibrant cultural scene and laid-back surfer vibe. It's often been referred to as the birthplace of California, because it was European explorers' first landing point in the state's present-day borders. Before that, it was home to many Native American tribes, with settlements dating back thousands of years. Today, it's a bustling, diverse city with ties to numerous industries, including military, higher education, health care, tourism and research and development. If you work in manufacturing, horticulture, clean tech, marketing, publishing or the aerospace industry, you'll find plenty of jobs in San Diego. The area also offers abundant employment in the tourism, retail, food service and entertainment sectors. Several national defense contractors are headquartered in San Diego, and it's the home base of the largest naval fleet in the world. Its position on the Pacific Coast makes the city an important place for the U.S. Navy, Coast Guard and Marine Corps. San Diego's population has consistently increased over the past several years, with new residents steadily flocking to the beach city. You'll enjoy numerous amenities, ranging from health care to entertainment venues to shopping and dining. Thanks to the year-round mild weather, you can enjoy a wide range of outdoor activities in any season. Balboa Park has over 1,000 acres of gardens, natural vegetation and cultural sites to explore, and the miles of sunny beaches in San Diego are busy nearly every day. La Jolla is home to the Scripps Institution of Oceanography, one of America's oldest oceanographic institutes. A mix of sandy beaches, secluded sea caves and rocky coves make up the area's shoreline, and you can often spot large groups of the famous La Jolla sea lions snoozing in the sun. The hilly peninsula of Point Loma was where the first Europeans landed when they arrived in present-day California, led by Portuguese explorer Juan Rodriguez Cabrillo. But the Portuguese weren't the first to live in Point Loma; paleontologists have discovered that it was one of the few places in California where dinosaurs roamed millions of years ago. Hillcrest is a densely populated neighborhood of San Diego, well known for its diversity and annual Pride Parade. This trendy area is filled with hip cafes, vintage shops and many other unique businesses. The Mission Hills neighborhood overlooks much of San Diego, including Old Town and San Diego Bay. Many of its residences were built in the early 20th century, and have been preserved and restored to pristine condition. The San Diego Unified School District manages the majority of public schools in San Diego, and is one of the largest school districts in California. Started in 1854 with just one teacher and a tiny building, it now includes a wide variety of school options, including traditional, alternative and charter schools. In addition to public schools, San Diego offers many private school options. There are also a number of colleges and universities in the city, both public and private. If you're pursuing higher education, schools such as San Diego State University, University of California (San Diego) and Point Loma Nazarene University are among your many options. 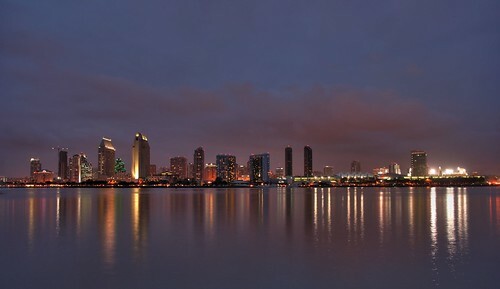 In addition, San Diego is home to one major medical school and three law schools. Utilities: Water is provided by the City of San Diego, and electric and gas utilities are supplied by San Diego Gas & Electric. Garbage and Recycling: The City of San Diego manages the regular pick-up of garbage and recycling, and you can find your neighborhood's collection schedule on their website. In addition, you can pick up mulch and compost from the city's Miramar Greenery for a small fee. Transportation: Although the most common mode of San Diego transportation is a personal vehicle, there are public transit options available. The Metropolitan Transit System provides service by bus, trolley and para-transit. Pets: All dogs in San Diego must be licensed, which requires an up-to-date rabies vaccination. You have 30 days from your arrival date to purchase your pet's license. Housing prices have been on a steady upswing in recent years, with the trend expected to continue. High demand and declining real estate inventory might make it difficult to find housing, but there is a range of options in San Diego, including single- and multi-family residences. Although housing prices can be very high in this area, you can find small, quaint cottages at reasonable prices, as well as larger, more extravagant homes. Our lowest priced units in San Diego, CA average $76.39 per month. 1405 people have reserved units in San Diego, CA in the past 30 days. There are 18 locations within San Diego, CA's city limits. There are 5 locations in San Diego, CA that offer AC and Heating features.